First US Poster for Jason Reitman's Up in the Air Lands! Oh hell yes! Empire has debuted the first official poster for Jason Reitman's Up in the Air today. It's a lot different than the teaser poster we saw a few months back on display at CinExpo, but it's still a great design. This is probably my most anticipated non-sci-fi movie left this year and thankfully I'll have the chance to see up at the Toronto Film Festival next month. I don't even care that the three of them look Photoshopped, this poster just makes me so excited. I've done so much traveling in my life, that a movie about a businessman whose life is spent "in the air," made by the guy who did Thank You for Smoking, is just plain awesome. Update: Our friends at SlashFilm have actually debuted the official US poster (seen to the right), which is a slight variation on the original international poster and includes a Thank You for Smoking mention as well. Additionally, they debuted the first photo from the film, which I've added below the posters. Enjoy! Update #2: We were asked to remove the original Empire poster but have kept the new official US poster (as seen above). Sorry for all the confusion and changes all day. Still glad we have a poster for this finally! 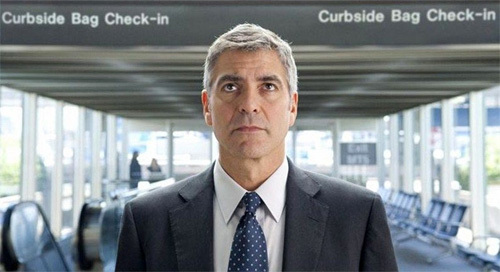 From Jason Reitman, the Oscar-nominated director of Juno and Thank You for Smoking, comes a comedy starring George Clooney as Ryan Bingham, a corporate downsizing expert whose cherished life on the road is threatened just as he is on the cusp of reaching ten million frequent flyer miles and just after he's met the frequent-traveller woman of his dreams. 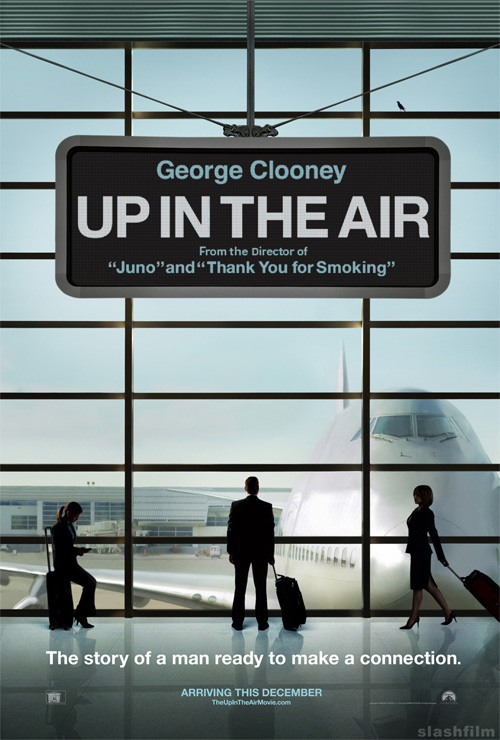 In addition to Clooney, Up in the Air stars Vera Farmiga, Anna Kendrick, and Jason Bateman. Based on Walter Kirn's novel of the same name. This will premiere at the Toronto Film Festival and hit theaters (most likely) in December. The trailer arrives on September 10th. For some reason, the poster reminds me of "Catch Me If You Can". indeed, alex......the plot you mention does sound pretty interesting. as long as it doesn't end up as as just another cookie-cutter romantic comedy, this could be a decent movie. Of course they would go with Clooney's face the promote the movie. Still, this effort really doesn't scream creativity, meh. Really liked the teaser poster, though. I think it looks great, nice composition! Vera Farmiga is VERA NICE~! (and so's that psychologist lady from the Departed) Clooney's one happy piece a meat, by this poster's narrative. Vera Farmiga IS the therapist from The Departed. I'm excited for this as well and I can't wait to hear your thoughts since you get to see it next month but I'm not wild about this poster at all. I prefer the teaser poster. Definitely looking forward to this (along with Clooney's other movie THE MEN WHO STARE AT GOATS). Not surprised that the trailer will debut with George's buddy Matt's new movie. I liked the international poster better, but I knew something wasn't right when I noticed that Jason Bateman, who plays a major character, wasn't listed with the cast in the poster credits. Vera and Anna looked VERY sharp in that first poster. Something about a woman in a business suit and high heels always gets my attention.